First used by aboriginals and fur traders, the canoe is a true symbol of Kawartha Lakes history. It was the transportation of choice for most of the early 20th century and remains popular today. Kayaks also started to become widely used in the latter half of the 1900s, loved for their single-man handling and efficient double-paddle. Today we see many canoes and kayaks on both of Bobcaygeon's lakes. Sturgeon and Pigeon offer many sheltered bays away from heavy boat traffic and ideal for paddling. Pigeon Lake, 27 km long and up to 3 km wide, offers several canoe and kayak destinations -- two sandbars where you can take a dip and cool off in the shallow waters. One is near Long Point Bay and the other is a little north of Grenadier Island. You can also tour around Bobcaygeon where you can dock and get out and explore the town for great shopping and restaurants and a short walk to Kawartha Dairy to indulge in the kind of ice cream dreams are made of. Boyd Island (also known as Big or Chiminis Island) is an 1,100 acre island owned by the Kawartha Land Trust. The pristine and scenic shoreline is ideal for paddling along and fishing is good. You can also put your canoe or kayak ashore and explore the trail. Back Channel is on the east side of the island and has calmer water and protection from the wind, making it a favourite for houseboat mooring. Nogies Creek, at the north mouth of Pigeon Lake, is also a pretty destination with lots to see as you paddle past Pigeon Lake Resort, Caygeon Cove Resort, R&R Houseboats, Bell Haven Park, and Nogies Creek Resort. From Pigeon, without going through any locks you can enter Chemong, Buckhorn and the Bald Lakes. 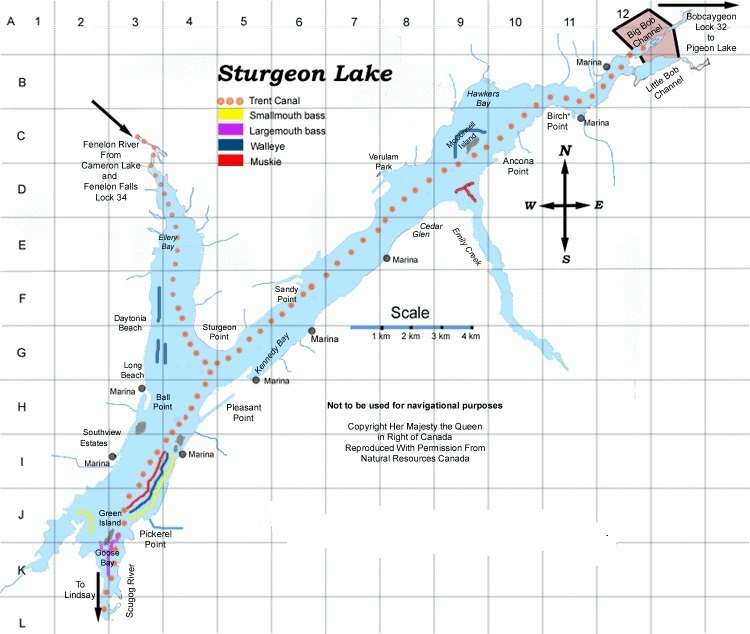 Sturgeon Lake is Y-shaped and is approximately 25 km from the southern to the north-eastern extreme (the longer axis), and offers many scenic paddling destinations. If you're looking for a fun little trip, try setting off from one of Bobcaygeon's boat launches, and paddle along the pretty Sturgeon Lake northern shoreline, making Eganridge your destination for lunch or dinner on the patio. You can park your kayak on their beach. Call ahead for reservations recommended (705-738-5111). Or you might head for the pretty little beach with playground, washroom, and covered picnic tables on the southern shore of Sturgeon Lake, about 7 km west from Bobcaygeon. Pack a picnic lunch and enjoy this scenic paddle. There are several good places to launch your canoe or kayak here, so you can also park here -- it's on Hwy. 24 -- and paddle to Bobcaygeon.